First cut a 6" x 9 1/2" piece of Stampin' Up! Elegant Eggplant card stock and fold it in half for the base, a 4 1/2" x 5 3/4" piece of Stampin' Up! Island Indigo for the middle layer and a 4 1/4" x 5 1/2" piece of white for the front. Then spritz the front layer with water, use an aqua painter to randomly apply Island Indigo, Elegant Eggplant, and Melon Mambo inks then allow to dry completely. 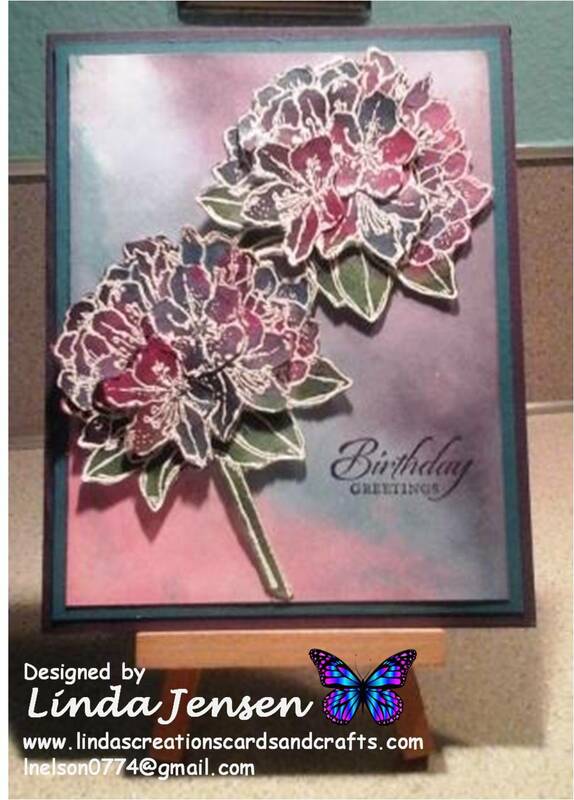 Meanwhile heat emboss four flowers on white card stock with Versamark ink and white embossing powder. Then spritz each one with water and randomly apply the above inks to the blossoms and Garden Green to the leaves and stems. Allow to dry completely then cut out each flower leaving the stem on one. Next create the 3D effect by cutting out pieces of blooms from two of the flowers and attaching them to the other two with mini pop dots. Then stamp the sentiment in Elegant Eggplant ink with a stamp from a Stampin' Up! Wetlands set, attach the front to the middle layer then to the base and enjoy!